Today I finished the first tin ceiling. I wanted to get the one in the hallway done first because our carpenter neighbor (Vince) is doing some reno work for us. The 2x10s that I was using for staging were destined to be a carrying beam in the dining room. the span across the dining room is 18 feet and the second floor joists are 2x8s. 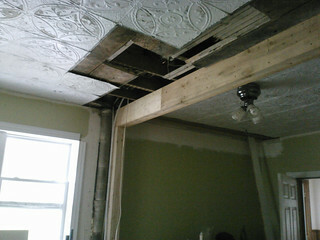 I have two more tin ceilings partially done. Both have their coat of metal primer. The ceiling in the lower picture now has two coats of white on about 2/3 of it. The remaining 1/3 has one coat. The third ceiling looks pretty much like the lower picture except there is a ceiling fan in the center of the room. The good news is that the latex paint goes on much faster than the metal primer. So much faster that two coats of the latex takes less time to apply than the coat of primer does. I’m hoping that by the end of next weekend I’ll have primer on a fourth ceiling and the other two ceilings completely done. Our house has six tin ceilings circa 1900 or so. The house had been left unheated the two winters before we bought it. The combination of cold and moisture separated some of the paint from the tin ceilings. When there were five of us living in the house it was a bit difficult to free up a room to scrape the ceiling. After Sarah moved out about 3 years ago we had been able to cycle things around and empty a room at a time. While the room was empty, we painted, repaired walls & scraped the ceiling if it was tin. One of the six rooms is one of the upstairs hallway (and stairs). To do that ceiling I needed to block off the stairs plus put some type of staging over the stairs so that I could get the ceiling above them. In addition to picking a time to block the stairs I’ve been waiting for warm weather where we could leave the upstairs windows open for a couple days at a time. The exposed tin cannot be directly painted with latex paint. The tin needs a coat of metal primer paint. The grey areas are the areas with metal primer. Metal primer is solvent based so when I’m painting it gives off quite a bit of fumes. I have a respirator mask so I’m protected but that doesn’t protect anyone else in the house. Every time I paint a ceiling we vacate the house for 1-2 days while the fumes dissipate through the open windows. I’m hoping to get five of the six ceilings primed and painted this month. It is going to make for some busy weekends and few days away from home each week. Of the six ceilings, almost all of the paint on two of them had mostly separated from the metal. I have one of those primed. It took about 5 hours with a brush. We can write a couple hours of that off to education & learning what techniques do and do not work.